the futuristic techniques illustrated in this book are now available to you! 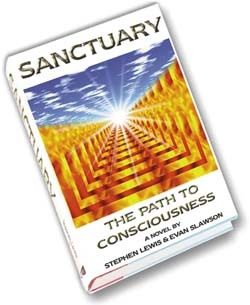 Sanctuary: The Path to Consciousness, written by Stephen Lewis & Evan Slawson, is the long-awaited book about the subtle-energy work of Stephen Lewis. It is the first book written on the futuristic use of subtle-energy technology for creating and maintaining well-being. Written in novel form, this book clearly illustrates the principles and future directions of Stephen's work and is packed with insights about subtle-energy exploration and what it can mean for you in today's world. "Sanctuary is a wonderful book describing a new way of viewing human well-being and consciousness from the latest perspective of subtle energy. I highly recommend that everyone read this book." "As a member of Sanctuary for many years, the techniques illustrated in this book seem quite normal to me and to the many people I have sent to the real-life Max. ...Sanctuary is the most glorious gift that anyone could ever receive." "To those who have an open mind, the information in this book will expand the possibilities, opportunities and consciousness of self exploration and discovery." "I've been fortunate enough to have worked with the real Max for over 3 years. I don't know what I would do without him. I don't believe anyone can afford not to be a part of it." "Humanity is coming into a newer dimension and expressing itself in a more spiritual/ subtle form. Sanctuary is on the cutting edge of many aspects of this emergence. Like most ideas and events on the planet, it works "better" if you use it. Don't miss out on your own life!" "I've seen Max do some amazing things, with me and with others. It would be unfortunate for anyone not to avail themselves of energetic balancing." "We feel everyone should have the opportunity provided by Sanctuary." "The future is here. Check it out." "The author of Sanctuary: The Path of Consciousness talk about the almost unbelievable ground-breaking technology they introduced within the framework of that novel. The Quantum Consciousness universe of exceptional well-being and enhanced potential with which they are working is one that in time will be taken for granted -- rather than as the miracle it appears to be at this moment of our understanding." Epilogue: The Evolution of AIM is available on-line. If you have the book and do not have the Epilogue as a separate booklet glued inside the back cover, please click on "The Book" above, then choose one of the links to the Epilogue.